Since taking over the column, I’ve tried to keep my readings loosely tied by a common theme, either of content or style. I had planned a column on non-fiction for today, but a quick glimpse of the New Arrivals shelf on my way out of the Library put the kibosh on my plans; more on that in an instant. But upon further cogitation, maybe there is somewhat of a loose theme keeping my selections for this column hogtied together: the word GRIT. The good ol’ Oxford tells us that, among other more material meaning, the word grit means “courage and resolve; strength of character”. This definition certainly holds true for today’s tomes: to wit, James Ellroy’s gritty My Dark Places: an LA Crime Memoir (1996), and Charles Portis’ True Grit (1968). Ellroy is no slouch in the grit department, having penned such muscular period noir novels as LA Confidential, and The Big Nowhere; LA Confidential is, in fact, one of my all-time favourite books, and a solid film to boot. But today’s slab of mid-century crime takes on a different form than the rest of Ellroy’s oeuvre. More of an auto-biography of sorts, My Dark Places offers a detail account of the murder of Ellroy’s mother, Jean, and the subsequent investigation the author and a retired LA investigator led to try and solve the crime. The unsolved murder of his mother played a critical role in shaping Ellroy’s future, and became an obsession that he would eventually transfer to another similar unsolved murder, that of Elizabeth Short, best known as the Black Dahlia murder. My Dark Places is a collection of essays and investigative journalism done up in Ellroy’s inimitable style. I won’t ruin the results of the investigation, but will say that Ellroy’s patented nihilism is in full-bloom here, as is his talent for gut-punching prose. 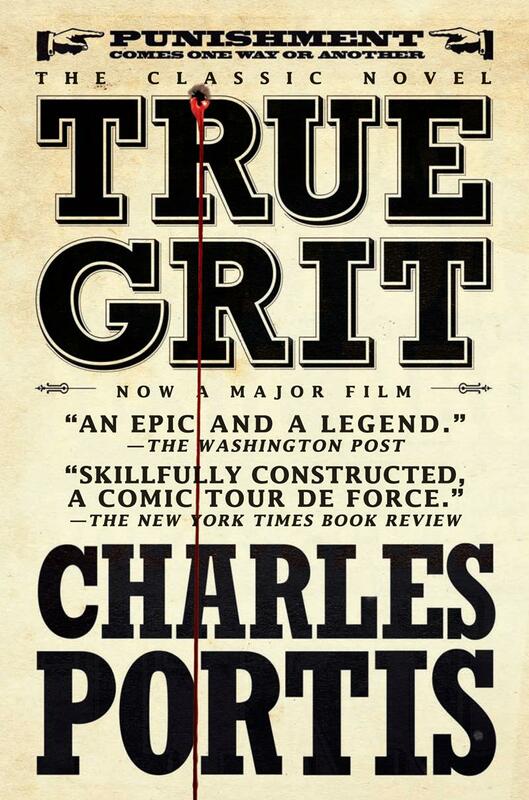 While Ellroy was busy growing up obsessed with murder, Charles Portis was whipping up True Grit, his tale of a young girl named Mattie Ross, a flea-ridden Marshal named Cogburn, and the cow-lick sportin’ Ranger LaBoeuf. The story (recently turned into a magnificent film by the Coen Brothers, who walk among us mortals as the ancient Greek gods once did) is concerned with young Mattie seeking to avenge her father’s murder at the hands of the roustabout Tom Chaney. (I guess parricide also makes for a loose theme in today’s column…). Told from the perspective of a much older Mattie reminiscing, the story performs, as do all great Westerns, as a sort of fusion between the dust-trail grittiness (there’s that word again) of the frontier world, and the genteel, poetic language and rules of societal engagement generally reserved for George Elliot novels. Cogburn looks like lice paradise, but expresses himself as formally as would any Victorian-era debutante. Young Mattie is the very picture of “courage and resolve; strength of character”, and the twist of placing a young girl in the middle what is nominally a very traditional male right-of-passage story gives the narrative a fresh and surprisingly effective emotional payoff. The book is also funny as all get-out. On a final note, if you’re planning on attending the Murder on the Menu evening, consider going as James Ellroy; all you need are some round glasses, a bushy moustache, a bowtie, and a dose of unhealthy obsession.